Moving Ahead Services offers rolls of packing tape for you to order to better enable your packing efforts as you prepare to move. 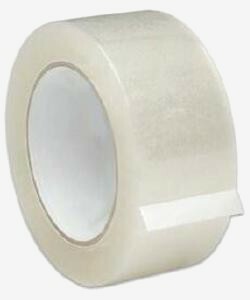 Our packing tape can be purchased in 55 yard rolls for very inexpensive prices, allowing you to order as much tape as you think you will need without having to worry about the cost. This tan colored packing tape is standard to the industry and will ensure that all of your boxes are tightly sealed to avoid the potential dislodging of your belongings while in transit. While a roll of 55 yards is usually more than enough for the average moving job, if you have a particularly large quantity of items to pack, you may want to consider ordering an additional roll or two just to be safe. The tape also works well to insulate the interior of your boxes with packing paper or bubble wrap for cushioning, so if you think that you are going to apply such cushioning to many or all of your boxes, then you may wish to order extra rolls of tape. You can get the most benefit out of our packing tape when you also enlist our available packing services, as our expertly trained movers will then be able to use the tape as concisely as possible so that it doesn’t go to waste, also ensuring that everything is properly sealed. We recommend that you purchase packing tape from us rather than from your local store because our tape was specifically designed for cardboard boxes and is guaranteed to be strong enough. 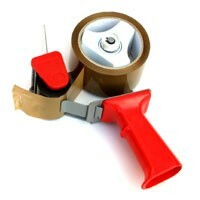 A lot of the tape that you’ll find at a nearby drugstore ends up not sticking very well, but the packing tape that you would get from Moving Ahead Services has never let a customer down to date.